So… duh, I like to run in sandals a fair bit. I also run in a number of other types of shoes, but for me there’s nothing like the freedom of feeling the air under my feet as I flit along a trail with a minimum of rubber or leather strapped to my feet. Usually I have run in sandals in the style of the Raramuri, where the attachment point runs between my big and second toe. But there’s other ways to shod a panther…. You might remember, back in the day (depending on how old you are) a thing called a “sport sandal”. There were a few out there. Teva was one. I had a few pairs. Never ran in them though. They were heavy. Stiff. The straps were not especially comfortable. But they were tough. They didn’t fall off. They were pretty difficult to wear out or break. That was about all they had going for them. But the concept was sound. If only someone got the execution down. The Z-Trail sport is like the “after” photo of a Teva. Light. Lithe. Supple straps. Soft, flexible sole. Grippy, comfortable. They are both sport sandals in the same way that a Nissan Leaf and a Tesla Model S are both electric cars. The first thing you notice when you put them on is the weight, or rather, the lack of weight. Other running sandals are light by nature, but the Z-Trail is ethereal. The next thing you notice as you head out on the trail is the perfect amount of proprioception you get as you run over rocks, branches, ground squirrels. The feel is beautiful, connected. A mountain of grip, but enough cushion to give a little relief when dirt turns to pavement. Then you’ll find yourself wearing these to the grocery store. To the mall. Around town. Walking to school. You get my drift. I can’t stress the comfort. How Xeroshoes attains this is borderline genius. 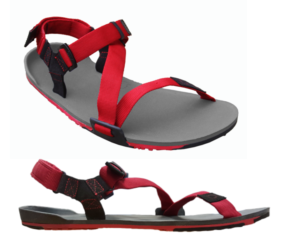 Where most sandals are just one layer or maybe 2 laminated layers, the Z-Trail combines a number of layers. One for comfort next to your foot, another for a bit of cushion, a third for traction and durability, plus a bit of “penetration” protection. In my area we see a lot of nasty thorns trying to make their way through the bottoms of shoes. A few made it a frightening amount through another pair of my sandals. The Z-trail? Laughed them off. I didn’t even find any broken off thorns. They just didn’t have a chance. So, awesome running sandals that are light, durable AND comfortable? They probably cost a mint! Nope. They’re actually on the low side of the performance running sandal market. And considering they’re a premium product, that makes them a ridiculously good deal. Finally, and I’m writing this because they don’t announce it loudly or crow on about it, but it is very important to know… Xeroshoes support the Tarahumara Children’s Hospital Fund with 10% of their sales. That is awesome. It is a really important charity, and worthy of support. I salute Xeroshoes for their generous donation to this cause. Low: Um… they only come in 3 colors? I only have one pair right now? I got nuthin. Full disclosure: I was provided a pair of Umara Z-Trail sandals to test out for a potential review. This entry was posted in Gear Review, Running and tagged born to run, Fitness, health, Luna Sandals, running, shoe, Xeroshoes by TheFatPanther. Bookmark the permalink.